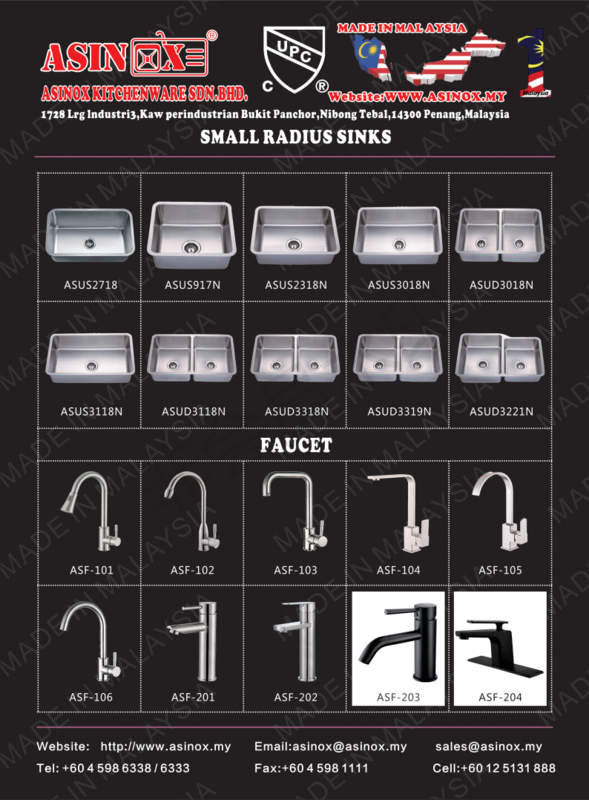 We ASINOX KITCHENWARE SDN.BHD as a leading stainless steel sink manufacturer located in PENANG , MALAYSIA we have made for creating the most comfortable and high quality of kitchen life style with producing the high quality of kitchenware, stainless steel sink, by our workers' hardworking, co-operation and advanced technology. The stainless steel sinks we producing is made of high-grade stainless steel materials AISI 316 & 304, we have top grade stainless steel board ,ONE -PIECE DOUBLE BOWL DEPTH DRAWN SINK AND SEAMLESS WELDING which can well ensure the capability of anticorrosion and anti-deformation. OEM & ODM ARE WELCOME. 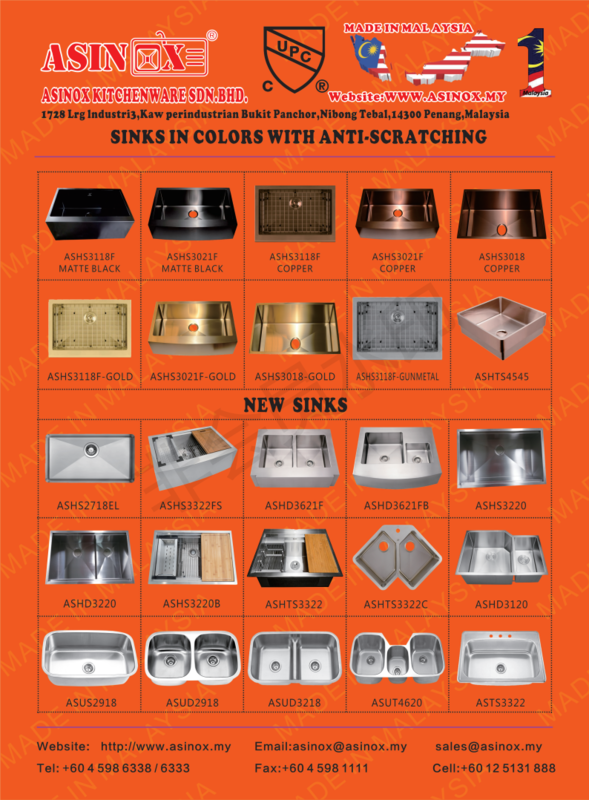 We produce undermount sink, topmount sink, bar sink, ADA sink, we have high grade stainless steel FABRICATED HANDMADE SINK of radius 5,10,15 & ZERO ,TOP ZERO RV SINK and aslo APRON FARM SINKS, SINK GRID, which can produced by any sizes diamesions according to your need with MOQ quatity. With more than 20 years experience in OEM, we are able to provide excellent products to the world wide market. We have invested heavily in enlarging our manufacturing capacity to ensure the 50 thousand pieces of s/s sinks monthly output. Strong produce ability and high effective advanced management well ensure that we are able to accomplish orders with very competitive prices. With years of global market service experience, our international sales luxury teams can surely support your demands in every details. OUR CUPC CERTIFICATE OF LISTING FILE NUMBER is 8329. Made of high grade stainless steel, we can make sinks as customers' requirement design.